The first hole is all down hill, especially from about 150 out. 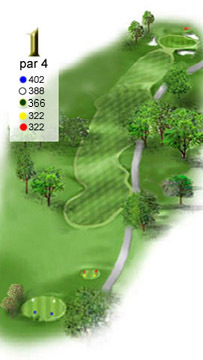 A shot off center can get you in trouble both right and left by placing you behind a row of trees on either side of the fairway. Place your second shot off to the right and you'll find yourself chipping over a green side bunker. If you should go left and long with your second shot you'll have a chip over another green side bunker.